Pasta, pizza, wine – what’s not to love about the food and beverage exports from our favourite boot-shaped country? Italian food for many is a no-brainer and in Vancouver, we have plenty of amazing and quality spots to choose from. It doesn’t matter what part of the city you’re in, there are authentic eats just around the corner. Here are some of the best Italian restaurants in the city. Located in a building on the corner of Alexander and Gore Street, Ask For Luigi offers a fabulously Italian-focused lunch, dinner, and weekend brunch menu with an array of tantalizing dishes. This spot for hand-crafted Italian eats is a fantastic place to head in a pair or for a group celebration. Pizza, pasta, wine, and beer – that’s all you need to be content and this South Granville gem has it all. The restaurant is serving up stellar Italian eats in a casual setting in buzzing Gastown. The subdivided space also holds a small coffee shop called Caffe Di Beppe. The cafe has a different address (2 West Cordova Street) and it’s all about the espresso, baked goods, and hot sandwiches – quick eats to keep you on the go. News of the fresh hand-made pasta made daily by Chef Mark Perrier has probably reached your ears, and with the rotating selection of Tagliatelle, Francobolli, and Linguine to name a few, we can safely say that’s a huge draw for diners to return. ‘Today’s Menu’ at Savio is just that. The ever-changing lineup gives the adventurous diner something to satiate their cravings, and then something different for the next visit. This Italian restaurant is known for its drool-worthy pasta and woodfired eats. Just climb the fairytale staircase and take a seat, because going to CinCin is always a dreamy foodie experience. One of our favourite places to head for pasta and pizza, once you bite into the offerings here you’ll understand why there’s typically a line for tables around meal time. The atmosphere is cozy but lively, a great place to start a night out or head for a later bite. This authentic Italian spot serves up traditional eats and cocktails in a 1970’s-inspired decor, it’ll take you back a few decades and surely leave you with some stellar new (and delicious) memories. Patrons who head to one of Sopra Sotto’s two locations can expect fresh Italian eats like pasta, salads, and pizza made with local ingredients. The latter is baked in a traditional forno a legna (wood-fired brick oven). Located at 631 Commercial Drive, this eatery took the place of one of Vancouver’s oldest restaurants Nick’s Spaghetti House after it closed after 62 years of operation. This classic spaghetti house features traditional Italian dishes like spaghetti and meatballs, veal parm, Caesar salad, shrimp scampi, and piccata along with baskets of white bread. Talk about a neighbourhood gem. Nestled into a suburban street of East Vancouver, just off Commercial Drive, this spot is a must-try for pizza and pasta if that’s what you’re after. Be sure to arrive before your hanger hits because there will be a line, but we assure you the wait will be worth it. This Tuscan-inspired restaurant is a definite crowd pleaser when it comes to quality grub. In the summer be sure to stop by and take a seat on Giardino’s epic Florentine-styled courtyard patio. Rustic and authentic, Cibo Trattoria offers a delicious array of Italian food for patrons in the downtown Vancouver area. Italian fine dining in the heart of Vancouver. La Terrazza has been serving patrons since 1998, that’s 20 years and counting, so you know the offerings, wine, and service have got to be impeccable. 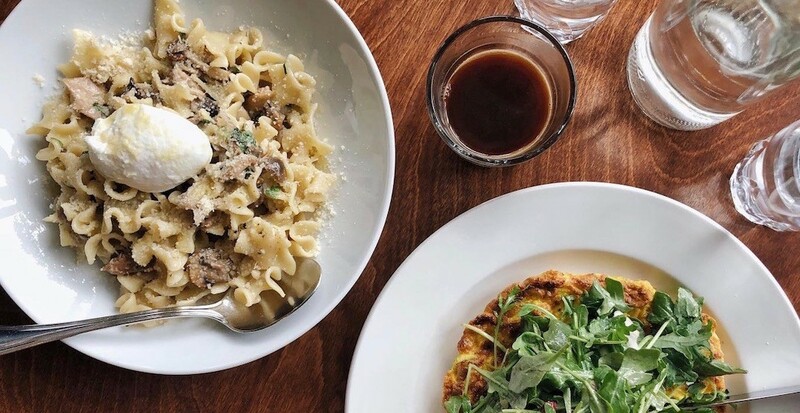 This cozy, romantic modern Italian restaurant is the perfect place to head for a quality bite in the heart of Yaletown. Cioppino’s offers classic Mediterranean cooking (and amazing pasta) in the heart of Yaletown. With Chef-Owner Giuseppe “Pino” Posteraro at the helm of the kitchen, diners are always in good hands here.